Is that a monkey? Or a mole-man? Jee-zus! 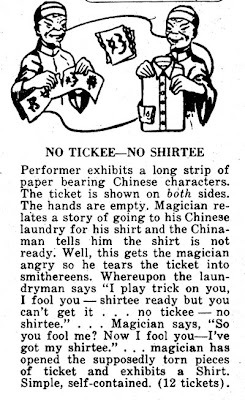 Scanned from an old newsprint catalog of magic tricks, which I picked up at a flea market. Just one of many mongoloid caricatures found throughout the book. The difference is, all the other tricks (chinese ring illusion, chinese wands, chinese bag) exploit the mysteries of the orient. This particular trick turns the tables on the cunning, unscrupulous chinaman; He thought he could steal from me, but I showed him. As for the saying itself, here's an explanation from everything2.com: "Typically, when people learn a new language, they layer their new vocabulary on top of the grammatical structure of their native language. No tickee no shirtee is a fine example of this linguistic phenomenon, for it is a transliteration into English of a perfectly grammatical and idiomatic Mandarin Chinese phrase: mei(2) pian(3) yi(1) mei(2) chun(3) yi(1); literally, no ticket, no shirt." Be sure to narrate the launderer's voice with a goofy, "mickey rooney from breakfast at tiffany's" accent, and wear one of these while doing the act.